St George's College is a unique location in Perth and is an ideal venue for functions, conferences, and school stays, with its historic atmosphere, space, and quiet serenity. The College boasts extensive gardens including our heritage-listed Rose Garden. We facilitate a number of function rooms seating between 10 and 60, with the Quadrangle having a capacity of 200. We are also equipped to host board meetings, professional development sessions, symposia and conferences. Projectors, wi-fi and sound facilities are available in all rooms, and the College can provide in-house catering ( Functions Menu below). The College's range of professional services, prime positioning and flexible accommodation can be readily integrated with UWA's diversity of conference, technical and sporting facilities to provide one of the most versatile meeting venues in Perth. 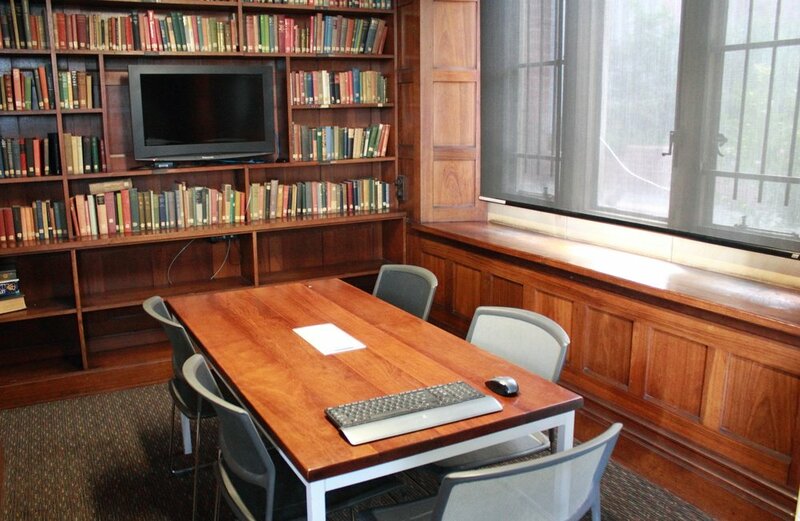 Meeting rooms at St George's College can be booked throughout the year. Other spaces are available from the end of November until the beginning of February and have limited availability during university terms. Serving as the College's boardroom, the Georgian Room is an elegant formal space suited to a variety of occasions. Located on the first floor of the College, the room is ideally suited to formal meetings, seminars, small lectures and private dining. The room features parquetry flooring, jarrah-panelled walls and inbuilt audio-visual equipment. Its capacity is 16 as a boardroom and 25 for banquet-style seating. The Junior Common Room is situated between the Rogerson Cafe and the College library on the ground floor. Its high ceilings, jarrah wall panelling, traditional fireplace and Chesterfield lounges create a cosy blend of old-meets-new. One of the College's most popular venues, this highly adaptable room has been used for cocktail parties, lectures, pre-dinner drinks and medium-sized meetings. The room also features inbuilt audio-visual facilities. It has a capacity for 50 seated or 70-80 cocktail-style. Named in honour of one of the College's Wardens, the Reynolds Room is a perfect space for small meetings, seminars and discussions. Located on the ground floor of the College, the Reynolds Room offers easy access to the Rogerson Cafe and the College Quadrangle. The room features jarrah-panelled walls, carpeted floor and audio-visual capabilities with a capacity of 15-20. The Library has a club-like ambience with its blend of traditional architecture and modern technololgy. The library boasts stunning views of the College gardens and over to the Swan River, and is perfect for small meetings or events. It has a capacity of 15-20 seated and 40 cocktail-style. The magnificent dining hall is central to St George's College. With a portrait of Sir John Winthrop Hackett, founder of the University of Western Australia hanging over the beautiful fireplace. The wood panelled walls, jarrah floor boards and majestic bay window lends to a majestic atmosphere. The Hackett Dining Hall has a capacity of 100. There is a superb opportunity during the university summer vacation period (roughly the end of November to mid-February) for school students, as a group, to experience College, the University of Western Australia and Perth life. During the stay, participants will be mentored by current St George's College scholars and visit many famous Perth sites and enjoy unique and valuable experiences. We consider the stays to be ideally suited to students aged about 12 to 16 years old. We would recommend that participants come from year groups specified by schools as most suitable. We offer stays for regional, interstate, and international students. 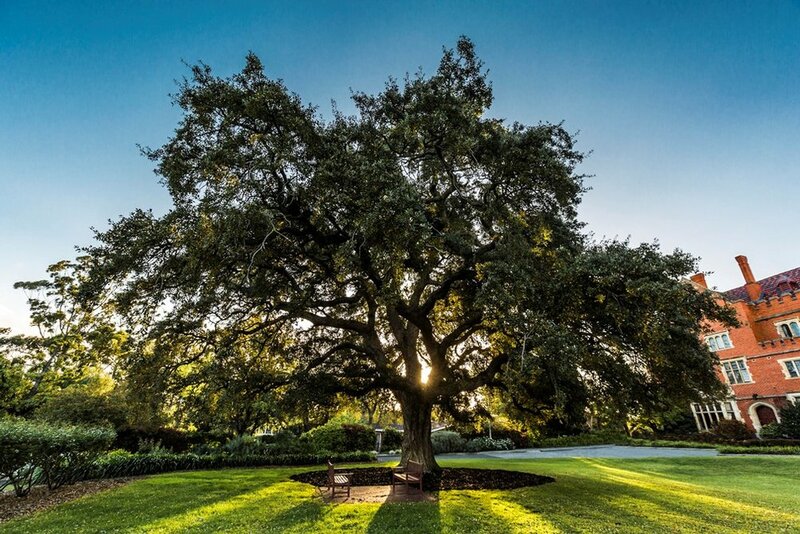 One of the original oak trees planted on the Front Lawn when the College was established in 1931.